The Houston City Council, led by out Mayor Annise Parker, passed an ordinance Wednesday that prohibits discrimination in employment, housing, and public accommodations, including on the basis of sexual orientation and gender identity. Houston City Council members approved the measure, or the Houston Equal Rights Ordinance, after hearing hours of passionate testimony in a 11-6 vote. More than 220 people testified before the council, Parker said, with a majority in favor of the ordinance. The ordinance bans discrimination in housing and employment among 14 characteristics – including protections based on sexual orientation and gender identity. It was a personal and public victory for openly-gay Mayor Annise Parker who began crafting the law back in December. She signed the ordinance shortly after the vote. 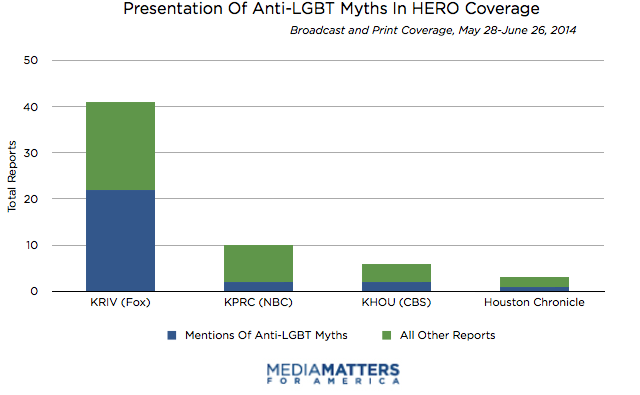 More Than Half Of Fox Affiliate KRIV’s Coverage Mentioned The Transgender Bathroom Myth. Only One Column, In The Houston Chronicle, Debunked Conservative Talking Points About The Ordinance. Equality Matters accessed The Houston Chronicle’s coverage by searching LexisNexis for the terms (gay or lesbian or bisexual or transgender or LGBT or sexual orientation or gender identity) and (discrimination or nondiscrimination or non-discrimination or anti-discrimination or antidiscrimination or Houston Equal Rights Ordinance or ordinance)between May 28 and June 26, 2014.Equality Matters ran the same search terms through TV Eyes for NBC affiliate KPRC, CBS affiliate KHOU, and Fox affiliate KRIV, also searching between May 28 and June 26. Outlets were considered to lend credence to misinformation against the ordinance if they reported opponents' misleading assertions without debunking the misinformation; outlets were considered to have debunked misinformation if they cited independent experts or figures in response to specific claims or if the outlet included editorial commentary rejecting such claims. 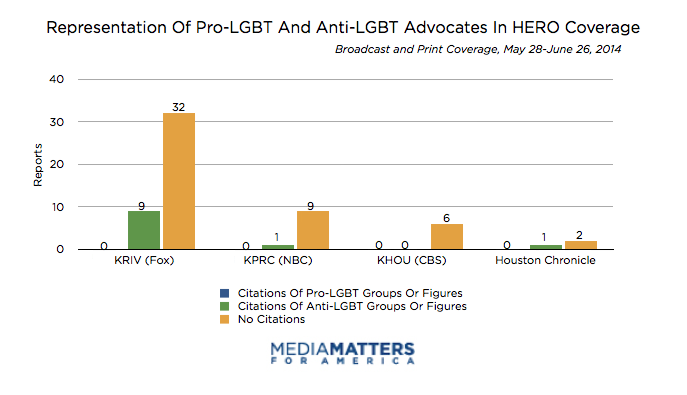 When counting pro-LGBT and anti-LGBT advocates, Equality Matters excluded members of the general public featured in person-on-the-street interviews as well as Mayor Annise Parker and members of the Houston City Council. Reruns, teases for upcoming segments, and passing mentions in the course of articles or segments about other topics were excluded. Because of technical problems within TV Eyes, Equality Matters excluded ABC affiliate KRTK from its search.